If you've been on Google's front page today, you probably noticed the animation above the search bar. Today is the 270th birthday of Alessandro Volta, the inventor of the battery. The first battery was created by Volta in 1800, the voltaic pile, a stack of zinc and copper plates, separated by brine soaked paper disks. Each stack of zinc-brine disk-copper formed an element. So, how does this have relevance to automobiles? Well, first off, without Volta's voltaic pile, we probably wouldn't have automotive batteries...heck, we likely wouldn't even have the automobile, period. In 2004, Toyota created their own tribute to Volta, an ItalDesign designed sports car concept bearing Volta's name. 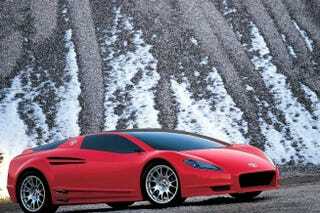 The Alessandro Volta ItalDesign Concept featured a carbon fiber chassis and a four-wheel-drive powertrain, sourced from the Lexus RX400h. Rear engined, with two additional electric motors, one at each axle, the combined power output was 408 hp, with a 0-60 time of 4.03 seconds and a top speed of 155 mph. Also, it's a three seater, sorta like a McLaren F1. On top of that, the Alessandro Volta ItalDesign Concept was unveiled at the 2004 Geneva Motor Show, and I'm sure you all know that Geneva is the next stop on the auto show circuit, so it's even more fitting to discuss this car.